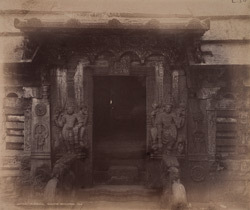 Photograph of the main entrance of the Ketapai Narayana temple, Bhatkal taken by Henry Cousens in either the 1880s or the 1890s. Bhatkal was a small town when Cousens visited yet the large numbers of ruined temples would suggest that at one point it had been one of the most important religious centres in Maharashtra. The Ketapai Narayana is a small, Hindu temple built in the 17th Century with a sloping stone-tiled roof situated within a courtyard surrounded by a colonnade. Cousens tells us in his report written at the time, that the sloping roof was necessary because coastal rainfall was greater than in the nearby hills. The influence of Vijayanagara can be seen in the animal balustrades and the statues of dvarapalas or guardian figures that protect the door and can be seen in this photograph. The stone railing between the peripheral columns create a screen wall whilst a stone-lamp column or dvajastambha stands in front of the temple.